The shim sham. The balboa. The jitterbug. The boogaloo. They are all derivatives or descendants of an energetic, stylistic dance form known collectively as swing. When John Travolta and Olivia Newton-John perform the intricate hand jive in Grease, that too can be traced back to the swing era which began in the 1920s when big bands were all the rage. Starting in Harlem, the swing sound and the dances associated with it spread across the country. St. Louis was no exception. Nearly a century later, swing dancing is alive and well here in part through the efforts of the Nevermore Ball and Swing Dance Festival organizers (and swing dance instructors) Christian Frommelt and Jenny Shirar. The Cherokee Street Jazz Crawl, taking place Saturday, November 5, features more than a dozen bands at a variety of venues up and down Cherokee Street as part of the multi-day festival of classes, dances, and performances running from Thursday through Sunday. I had a chance to talk to Christian and Jenny about what to expect in the 2016 edition of the event, including Saturday's several introductory-level classes offered in a variety of styles by a range of instructors. Bill Motchan: This year marks the fifth Cherokee Street Jazz Crawl. How did it originate? Christian Frommelt: The Nevermore Jazz Ball and St. Louis Swing Dance Festival was an event we started in 2007. We wanted to have our own dance festival here in town. We'd been traveling regionally, and we really wanted a dance event that was as fun but also showcased the city of St. Louis. The first year it was dances and classes, there was no Jazz Crawl, but we were at Casa Loma Ballroom and we said, it's really a shame that we're not getting people into more of these cool places up and down Cherokee, and our solution was the Jazz Crawl, which showcased bands that we didn't have space for on the dance schedule and it got people in to some of these really unique places that we wanted people to go into and patronize. So that was the genesis of the Jazz Crawl, which allowed us to showcase more of our local music as well as showcase our local businesses in that neighborhood. 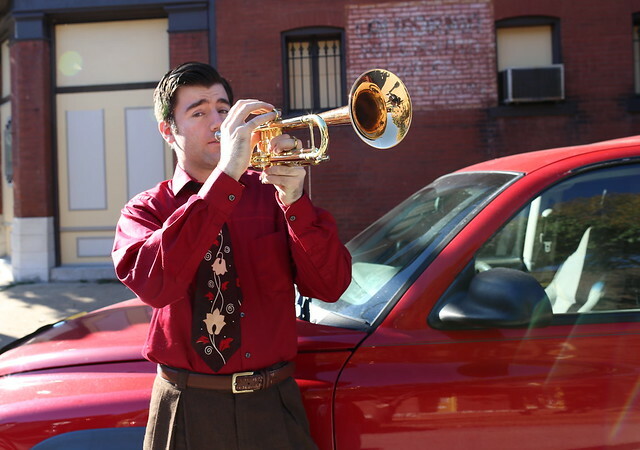 Bill: What sets the Cherokee Street Jazz Crawl apart from other swing dance festivals? Jenny Shirar: Lots of cities host swing dance festivals, they'll have dance workshops and dances at night. Most of them will bring in bands from out of town and they'll have the same ten swing bands from around the world that get hired. St. Louis is unique because we have such a wealth of amazing music acts here. There are lots of festivals that happen, but this is unique. There is nothing like the Jazz Crawl. The other thing great thing about it is we wanted to not just connect people with St. Louis music and St. Louis businesses but create a way for the festival to be open to people who might not have that much experience with swing dancing, or they might not be able to buy a ticket to the ball, and we wanted to create a festival that anyone could come to. It's free to audiences and communities and we can bring in more people. Bill: How did swing dancing become popular here? Christian: It's a little unique here. What's happening in St. Louis is a global trend. There are lots of young adults and very young folks learning to swing dance, and that's just the nature of the dance. It's very energetic. In the 1930s, it was really a young person's dance. We have people of all ages, but until the end of time, it will be led by the younger people who have the stamina to do it. But I think if you expose it to people of any age who have that energy, they'll want to try it. Bill: What age groups in St. Louis tend to be attracted to swing dancing? Jenny: The history of swing dancing in St. Louis is unique. There was a nationwide craze for swing dancing and big band music in the 30s and 40s and as the music changed and as air conditioning was invented, swing dancing might have died out, but in St. Louis there's been a continuous development of swing dance in the 60s, 70s, 80s and beyond, and they're continuing to do it, and in addition to this young, worldwide subculture of college age kids and twenty- and thirty-somethings are grabbing onto it. There's also a generation of swing dancers in St. Louis who started in the 60s and 70s, so we have this unique interaction and cross-generation. Bill: How did you get interested in swing dancing? Christian: I went to the University of Iowa as a freshman and that's where I went to my first swing dance class. Champaign-Urbana was a swing dancing hub for a while. Sometimes it's not a big city. The following year, in 2008, I transferred to Washington University -- the same time Jenny did -- and I told her, "You should really check out this swing dancing," and she did. From there we went together which included the St. Louis form of jitterbug and the St. Louis shag and the more general dance styles, the Lindy hoppers and the Harlem, and we all practiced and excelled at it that way. Bill: What should newcomers to swing dancing expect during the Jazz Crawl? Jenny: With the Jazz Crawl, you should definitely come with an open mind. A young, energetic style is very characteristic of the Lindy hop, but swing dancing is very adaptable. On November 5, for visitors, it's more about watching and taking in the spectacle. At the different types of venues you'll visit, you'll see St. Louis in all of its glory. Bill: Will there be opportunities to learn more about swing dancing during the Jazz Crawl? Jenny: We have a Community Dance Day during the Jazz Crawl, a day of free and open-to-the-public dance classes at 2720 Cherokee to make the festival more open and attractive to everyone. You can drop in and there will be classes in swing dance and the St. Louis shag and other styles like hip-hop, breakdance and the St. Louis bop, which is a great dance. It will start at 11 a.m. and continue until about 5 p.m. Christian and I have a group called the St. Louis Jitterbugs and we offer beginning dance classes through that group. Bill: Do you have to be in good physical condition to try out swing dancing? Christian: I think that swing dance gives you the opportunity to tell a different story. Jazz is very vast in terms of what it can make you feel. Swing dance is a very joyous, uninhibited, expressive activity and so that's why it's so infectious. Jenny: It's a jazz dance so it's improvisational in nature. When people learn it, there are some basic steps and patterns, but from there it's open and free form, so you can riff on it. And in our lives, there are not a lot of opportunities to do stuff like that, so for that reason swing dance is a great outlet. Bill: Is swing dancing difficult to master? Christian: The cool thing about it is you can be a beginner and go to a dance and dance with everybody. It's a very welcoming community. Everyone remembers when they were beginners. We don't have a dance that isn't all levels. There aren't dances that are just for beginners or for experts. And there are always new people coming in. The types of moves that are customary to learn in swing dance are the swingout, which is kind of a trademark eight-count move, the Lindy hop from Harlem, where you use the momentum that you and your partner have and the leader redirects the follower and you swing around each other and it really feels like flying. You can put your own spin on some of these traditional moves. And it keeps us pretty fit. Jenny: The barrier to entry is low and you can have a great time on the dance floor and like any hobby, the more you want to put into it, the more you can get out of it. So it's up to the individual dancer. There are some very complex moves where you flip each other over, but only in competition, not on the social dance floor. We practice, we learn, we put a lot of time into learning techniques and complex dance moves, so for us, we've gotten more serious about it. Bill: Have you noticed the popularity of swing dancing grown in St. Louis over the five years since you originated Nevermore Ball and the Jazz Crawl? Jenny: Yes, definitely. There are some people who we knew from dance events outside of St. Louis and they've actually moved here because they want to be in the heart of the action. Christian: And some people we've met who just stumbled on the Jazz Crawl because they were out and about and they said, "We want to learn how to dance!" Bill: What kind of impact has the Jazz Crawl had on the businesses along Cherokee Street? Jenny: Some businesses tell us they have their best day of the year during Jazz Crawl. It brings a lot of life to the street, a lot of foot traffic. We've gotten some good reports on the economic impact of it. Bill: The Nevermore Ball and Jazz Crawl "code" reads in part: "Nevermore is for fun! It's ok to take risks and try new things, be loud and silly at the right time and place, joke around, have some drinks (or not), relax and let loose. Nevermore is for fun! It's ok to take risks and try new things, be loud and silly at the right time and place, joke around, have some drinks (or not), relax and let loose." I can't help but realize that the event falls near the end of a particularly tense election season. Jenny: I think the thing that's really important to remember during a tense time in the country and in the world is that dance brings people together. It forces you to see someone as a human equal, and that's one of the most important and beautiful things about dance. Christian: That's one of the things dance has always done. It gives you a chance to relax. When you get on the dance floor, the things you've been worrying about just go away. Jazz Crawl notes and notables: In the first set, from 12:30 p.m. to 3:30 pm, Saxquest will feature a full orchestra; the Loot Rock Gang will be making their first appearance on the Jazz Crawl at Retro 101, and The Bottoms Up Blues Gang will make their first at Hop Shop. The Moonshine Rhythm Club, a Nashville-based band, will perform at Van Ella Studios. In addition to these, the first set will also include performances by Roth/Ryback Duo (South City Art Supply), Miss Jubilee (Foam Coffee and Beer), Wack-A-Doo (Fortune Teller), Sweetie & Chase Garrett (Bespoke), and The Gaslight Squares (Yaqui's house band). At 4 p.m. the second set will start off with a jazz jam led by veteran jazz trumpeter Bill Mason of St. Louis Ragtimers fame. Marty Eggers on bass/piano and Virginia Tichenor (daughter of St. Louis Ragtimers founder and composer Trebor Tichenor) on piano/percussion will help lead this jam at Yaqui's. Also in the second set will be Annie and the Fur Trappers at Propoganda.